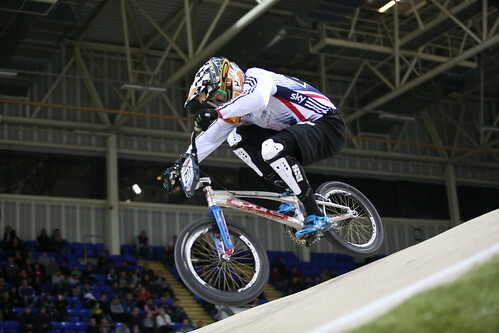 Great Britain Cycling Team’s Kyle Evans took seventh in the time trial superfinal at round two of the UCI BMX Supercross World Cup in Manchester. The 22-year-old stopped the clock in 29.299 seconds as Canadian Tory Nyhaug topped the podium in 28.830 seconds. "I put a pretty good lap together, I just messed up the last straight which scrubbed quite a bit of speed off," Evans said. "I was just trying to charge and do the best lap I could. Overall it’s not a bad lap." Liam Phillips, who has won the event at the National Cycling Centre for the last three years, booked his place in Sunday’s racing with three wins in qualifying. The 27-year-old’s teammates Tre Whyte, Quillan Isidore and Bethany Shriever also secured spots in the second day of racing. American Alise Post won the women’s time trial superfinal in 31.884 seconds ahead of time trial world champion Mariana Pajon. All the way to the line! Great Britain Cycling Team enjoyed a rewarding qualifying session that saw Liam Phillips, Tre Whyte, Quillan Isidore and Bethany Shriever all progress to Sunday’s racing. Defending world cup champion Phillips - who opted to miss the opening round in Argentina - powered through with a 100% record, winning his three heats. “It’s been a great afternoon,” Phillips said. “It’s my first race of the year. It’s nice to get out there and do a couple of starts in amongst people and ultimately do a couple of races before the more serious end of the racing happens tomorrow. Two wins and a third-place for Isidore was enough for 13th overall as the top 48 qualified. British champion Whyte faced a nervous wait to see if he had made the cut - fifth, first and sixth proved to be enough as the 22-year-old was placed 45th. British Cycling Junior Academy rider Bethany Shriever showed no sign of nerves on her UCI Supercross World Cup debut. The 16-year-old shone to take second, fourth and third for 11th overall as 24 riders secured their passage into Sunday’s racing. Fellow Britons Charlotte Green and Abbie Taylor will join the youngster in the final 32. "It has just been on another level, I'm thrilled." Racing concludes on Sunday with tickets available to purchase on the door at the National Cycling Centre. You can also follow the action on our live blog from 2.50pm.